Alright, the following treat was bought over the summer but I just never managed to fit it into my schedule. I guess the problem is that while it looks cool, I was afraid of the likely disappointment... or maybe I was just too lazy to go downstairs, iunno. Well, they are here now, so let's dig in. 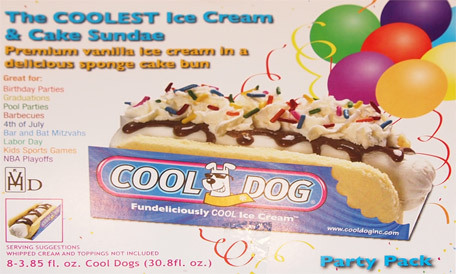 Now the cool dog claims to be "the COOLEST Ice Cream & Cake Sundae" by being premium vanilla ice cream in a delicious sponge cake bun... man, I hope they mean PREMIUM when they say it. 8 individually wrapped dogs approaching 4 fluid ounces each. I like the chocolate sauce to break things up visually (yes, one of them is a little messed up, but whatever). HAHAHA, I didn't even pick up on the bite mark on the cover of the box, that's such a nice touch. I love when a company knows to engage the customer as quickly as possible. I'll admit it, I thought this was going to be another dumb gimmicky product that we wasted our money on, but even after months and months in the freezer, these buggers are still tasty. 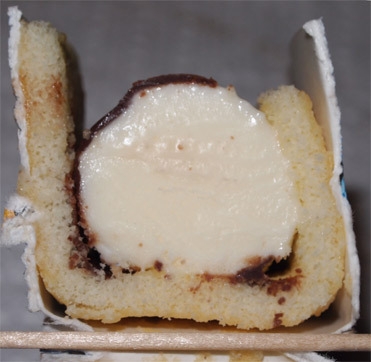 The bun looks little but it got a good ice cream to bun ratio, plus it's still fresh, spongy, and tasty. The hot dog filling is surprisingly full of vanilla flavor. I'm not sure that I'm picking up on the chocolate sauce a ton because I'm focusing on the bun, but the overall flavor is fun, light, and hitting the spot. 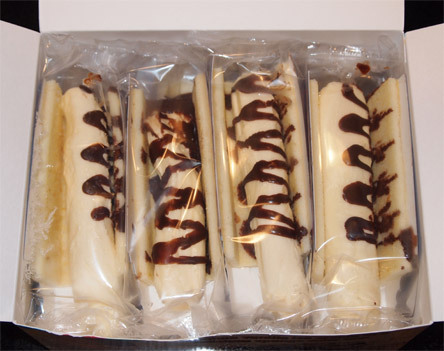 This is the one I gave to my daughter and then my wife had a plain one which she thoroughly enjoyed. I also did try the pictured suggestion of adding whipped cream on mine, but I ate the first half without it, and then the second half with. Either way is good. I really am impressed here. It's a cute little treat that actually brings the flavor. Now that I know how these taste (even unloaded), I'll totally grab one whenever I need a quick snack. Awesome job bringing the flavor. Go give these a try if you can, my wife found our box at iParty.You can also find more locations on the Cool Dog Inc website. Super cute idea Dubba. I'm def going to give these a try! Weird but tasty sounding treat. Except at my house we'd have to call them "Cool Cats," as my dogs find the term "hot/cool dog" offensive. THIS IS. BY. FAR. THE WEIRDEST ICE CREAM TREAT.